Grown for its tasty and nutritious leaves and leafstalks (petioles), chard is a good substitute for spinach in most recipes. Prefers cool weather, but lasts through summer without going to seed (bolting). Colorful leaves and petioles make it great for edible landscaping and ornamental plantings. Prefers full sun early in the season, part shade in summer when it’s warm. Prefers deep, loose, fertile soil, high in organic matter, with pH 6.0 to 7.0. Needs consistent moisture, especially as plants grow large. Requires thinning, but is otherwise relatively trouble-free. Depending on variety, leaves are dark to medium green, usually with red or white leafstalks and veins. ‘Bright Lights’ has leaf stalks that are red, white, orange, purple, gold, or pink. frost - Tolerates moderate frosts, but don’t plant in very early spring. Some varieties will bolt (go to seed) prematurely if exposed to prolonged freezing temperatures. not native to North America - Domesticated from wild species in the Eastern Mediterranean. Germination temperature: 40 F to 95 F - Optimum 85 F.
Start planting about 2 to 3 weeks before last expected frost. Sow seeds � to 1 inch deep, 2 to 6 inches apart, in rows 18 to 24 apart. 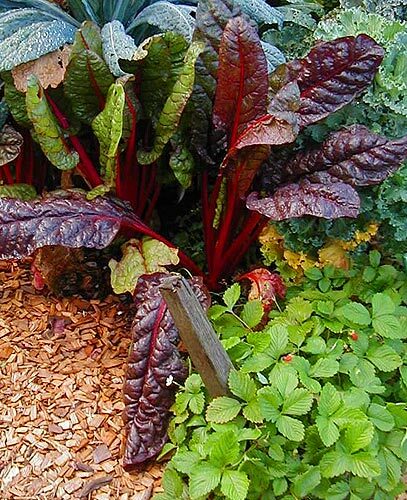 Like beets, chard “seeds” produce more than one plant, and so will require thinning. Thin to 6- to 12-inch spacings. If you plan to harvest whole plants, make succession plantings through late summer. Delay planting of ‘Ruby Red’ or ‘Rhubarb’ chard until after last frost. These varieties may go to seed (bolt) if seed is exposed to freezing temperatures. Mulch plants to retain moisture and suppress weeds. You can begin harvesting when leaves reach usable size. Remove a leaf or two from each plant, or cut plants an inch or two above the soil for cut-and-come-again harvest. Avoid damaging the growing point in the center of the plant at harvest. As plants age, older leaves get tough. Cut plants back to about 3 to 5 inches tall to encourage a flush of new, tender growth. 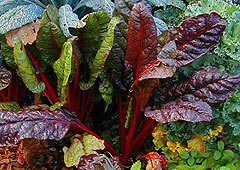 Browse Swiss chard varieties at our Vegetable Varieties for Gardeners website. Most varieties have either red or white stems. ‘Bright Lights’ – an All-America selection in 1998 – features mild flavor and a rainbow of stem colors (red, white, orange, purple, gold, pink) and bronze or green leaves. Swiss chard or stem chard has swollen midrib and petiole. Leaf beets or spinach beets lack a swollen midrib and petiole.